Like your editor, John Yellowlees has never been to New Zealand, but armed with a Dunedin Railways journey guide collected by HML Community Rial Partnership chair Sally Spaven and information from a talk by former ScotRail manager Bob Heasman he offers these thoughts. Some early New Zealand rail pioneers were intrepid : inhabitants of Invercargill reckoned that their town offered a better route into the Otago region than did Dunedin, and set about building a railway with timber rails and flangeless wheels, using locomotives that were too heavy, which proved to be disastrous when there was a fatal accident and the scheme ran out of money. With Invercargill thus bankrupted, Sir Julius Vogel, governor of the Australian province that NZ then comprised, set about building a national network in an ambitious plan based on American practice that nevertheless was cost-conscious, using the 3'6" gauge. The last line linking Christchurch with the Interislander train-ferry port of Picton was not completed until the 1950s, by which time rail was in decline, the seeds of its undoing all too evident in timetables which showed trains to be very slow and infrequent - but they were important in their time, and today remain vital for freight, with South Island long-distance scheduled passenger trains now reduced to the, at best, once-daily Christchurch-Picton (restored after earthquake damage) and Christchurch-Greymouth routes. Even the steam Kingston Flyer has been mothballed, many lines have been converted into cycle-routes, and except in the Auckland and Wellington commuting areas New Zealanders go everywhere by road or air. Auckland has seen substantial investment in electrifying its commuter network, and Wellington has had electric trains for many years. Otherwise almost the only glimmer of hope is the tourist trains run by Dunedin Council that operate out of the town's historic station - considered to be the most photographed building in all of New Zealand - by architect George A. Troup (known as a result of its grandiose appearance as "Gingerbread George") that last saw commuters in 1982 and long-distance trains in 2002. These operate inland to the Taieri Gorge and northwards along the coast. The Otago Excursion Train Trust had been running trains since 1979, and when in 1990 NZ Rail closed the line on completion of the Clyde hydro-electric power scheme they organised an appeal which raised $1.2m. The Trust and Dunedin City Council subsequently purchased the line and five locomotives. 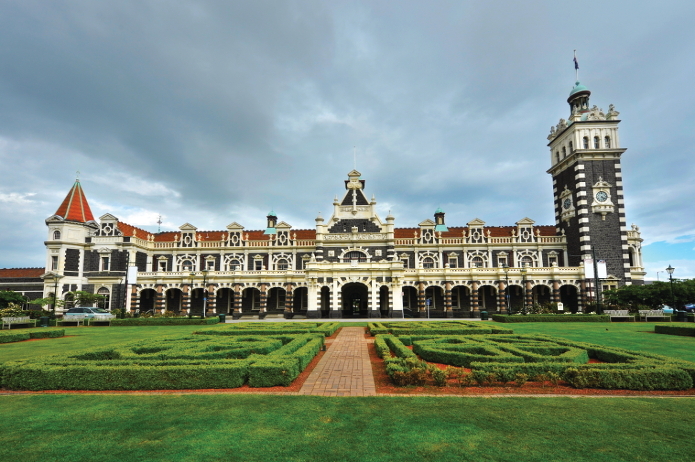 Then in 1994 the Government sold Dunedin Station to the City Council for $1, and in the following year Trust and Council established the Taieri Gorge Railway limited to run daily tourist trains. In 2004 the company began operating The Seasider service along the by now freight-only South Island main trunk line to Palmerston, and these were extended in 2015 to include regular trips to Otago's second largest urban area, Oamaru with a hop-on hop-off option at Moeraki Boulders. In 2014 Taieri Gorge Railways was rebranded as Dunedin Railways to reflect the diverse range of destinations and services the company operates, now using seven diesel-electric locomotives with eighteen carriages plus a Silver Fern two-coach railcar. What is the moral for us? Surely it is to be careful about what we wish for. New Zealand and Canada are often cited as exemplars offering much better tourist trains than Scotland's all-purpose diesel units. However over most of those countries the occasional leisurely tourist train with stop-offs at attractions may be all that is on offer to passengers. It is almost as though the operation of ScotRail had been taken over by The Royal Scotsman! !